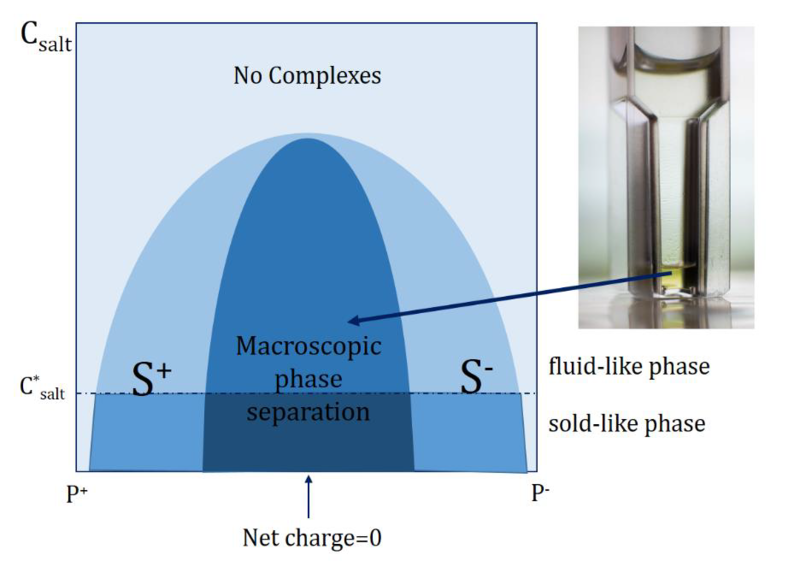 Complex coacervates are liquid phases which form when oppositely charged polyelectrolytes are mixed under the right conditions. Fig. 1 is a schematic diagram of the different phases which form when polyelectrolytes are mixed as a function of their composition (x-axis) and the salt concentration (y-axis). It can be seen that macroscopic complex coacervates only form around charge stoichiometry and above a certain salt concentration. Fig. 1. Stability diagram of polyelectrolyte complexes as a function of the ionic strength. On the horizontal axis is the composition of the mixture given. On the vertical axis is the salt concentration (Csalt). S indicates soluble polyelectrolyte complexes. The picture shows a concentrated complex coacervate phase and its dilute supernatant phase on top of it. We have found that we can incorporate very high amounts of proteins in these polyelectrolyte phases.1 This makes them interesting for applications like high-protein foods. In this project you will work together with AVEBE. In this collaboration there are several questions regarding the incorporation of potato protein in polyelectrolyte complexes/ complex coacervates. First of all would like to investigate whether a mixture of industrial proteins can be separated using polyelectrolyte complexes and what triggers e.g., increase in ionic strength, temperature or change of pH can be used to release the proteins from the polyion complex phase. With the high protein food application in mind we are interested in determining the maximal amount of protein which can be incorporated. 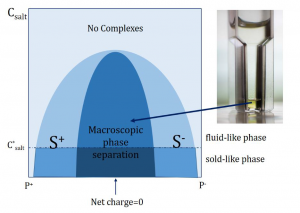 We further would like to assess how the incorporation changes the properties of the polyelectrolyte complex phase. Denatured proteins have a higher nutritional value, although our complex coacervates are not suitable for consumption, we would like to know whether it is possible to incorporate denatured proteins in the polyelectrolyte complex phases and whether we can denature the protein inside the complex phases. Part of this project could be setting-up an automated pipetting system to simplify the sample preparation. 1. Lindhoud, S.; Claessens, M. M. A. E. Soft Matter 2016, 12, (2), 408-413.